Registration for the 2019 Meeting will open on March 1, 2019. Regular long-standing members of SNL who have retired, may petition for Emeritus status by writing to the Society’s Executive Director. Emeritus status would entitle the member to receive a discounted registration rate equal to the Student Member rate at the time of registration. To receive the discounted rate, you must be a current SNL member. 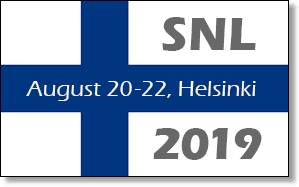 Registration fees will be refunded minus a $50 handling fee, provided the request for refund is received by SNL no later than July 1, 2019. No refunds will be issued after July 1, 2019. Refund requests must identify the registrant’s name, email address, membership level, and amount paid. Send refund requests to info@neurolang.org. Log in to your SNL Account, or Create a New Account, to register to attend. If you have any questions about your registration, please Contact Us.